Our third most popular version. The retail price is $15.95 for 90 pages. Eleven percent of the books we sell are PWS2’s. The PWS2 is basically the front half of a PWS4 as it does not contain Form C.
The PWS2 is basically the same book as the PWS1 but contains 20 more pages of Form B. 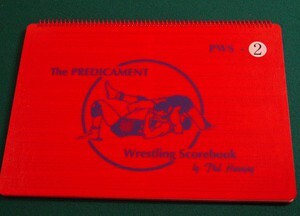 It is designed for teams that wrestle more matches each season. There are 72 pages of our Form B.